This article is about underground systems which distribute concentrated flow along a level, linear facility to promote infiltration to native soils. For a similar structure, which differs in being designed to receive excess flow and convey it, whilst promoting infiltration to native soils, see exfiltration trenches. 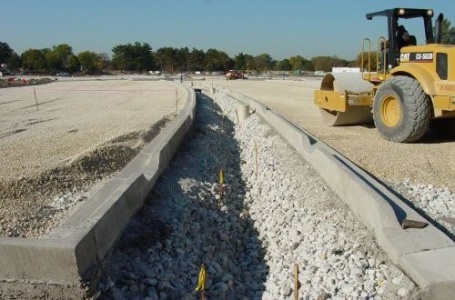 As their name suggests infiltration trenches work primarily to infiltrate and convey stormwaterSurface runoff from at-grade surfaces, resulting from rain or snowmelt events.. They are an underground facility and are excellently suited to connecting other components in the treatment trainStormwater management following the hierarchical approach: Source Control measures, Conveyance Control measure and End of Pipe treatment to achieve the water quality and water balance target for lot level development of the preferred strategy.A combination of lot level, conveyance, and end-of-pipe stormwater management practices..
Layers of coarse aggregate to bed the pipe, store and redistribute water. 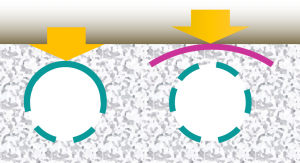 As shown in the illustration above a surface inlet to an infiltration trench may simply be a channel of decorative stone supported by a geotextile. So that at grade it may be indistinguishable from a gravel diaphragm. In function though, the decorative surface course of the infiltration trench needs to remain free-draining down into the trench, whereas the gravel diaphragmA level spreading device placed at a runoff discharge location, perpendicular to flow, to maintain sheet flow and distribute runoff as evenly as possible across a pervious area or stormwater infiltration practice. A gravel diaphragm acts as a pretreatment device, settling out suspended sediments before they reach the practice. is designed to spill over onto adjacent land, leaving sedimentSoil, sand and minerals washed from land into water, usually after rain. They pile up in reservoirs, rivers and harbors, destroying fish-nesting areas and holes of water animals and cloud the water so that needed sunlight might not reach aquatic plans. Careless farming, mining and building activities will expose sediment materials, allowing them to be washed off the land after rainfalls. behind in the gravel or stone channel. AggregateA broad category of particulate material used in construction, including sand, gravel, crushed stone, slag, recycled concrete and geosynthetic aggregates, and available in various particulate size gradations. Note the uniform size and angularity of this clear stone sample. Note also that the fragments all appear to have a film of fine particles adhering; this material would be improved by being washed prior to use. This article gives recommendations for aggregateA broad category of particulate material used in construction, including sand, gravel, crushed stone, slag, recycled concrete and geosynthetic aggregates, and available in various particulate size gradations. 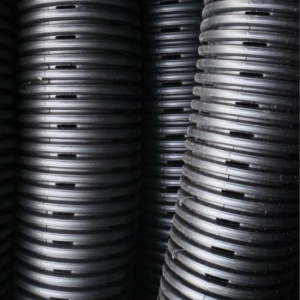 to be used to store water for infiltrationThe slow movement of water into or through a soil or drainage system.Penetration of water through the ground surface.. 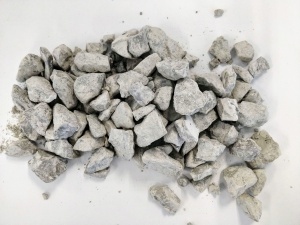 This is usually called 'Clear stone' at aggregateA broad category of particulate material used in construction, including sand, gravel, crushed stone, slag, recycled concrete and geosynthetic aggregates, and available in various particulate size gradations. yards. To see an analysis of Ontario Standard Specifications for granularGravel, or crushed stone of various size gradations (i.e., diameter), used in construction; void forming material used as bedding and runoff storage reservoirs and underdrains in stormwater infiltration practices. materials, see OPSS aggregates. Gravel used for underdrains in bioretention, infiltration trenches and chambers, and exfiltration trenches should be 20 or 50 mm, uniformly-graded, clean (maximum wash loss of 0.5%), crushed angular stone that has a void ratio of 0.4. The clean wash to prevent rapid accumulation of finesSoil particles with a diameter less than 0.050 mm. from the aggregateA broad category of particulate material used in construction, including sand, gravel, crushed stone, slag, recycled concrete and geosynthetic aggregates, and available in various particulate size gradations. particles in the base of the reservoir. The uniform grading and the angularity are important to maintain pore throats and clear voids between particles. (i.e. achieve the void ratio). Porosity and permeability are directly influenced by the size, gradation and angularity of the particles . See jar test for on-site verification testing protocols. Pipes are available with perforations on just one side, these should be situated on the lower half of the pipe. 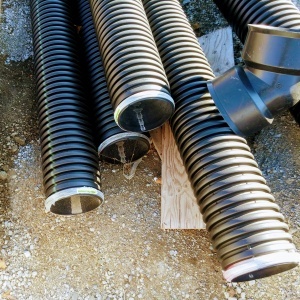 Pipes with 360° perforations should have a strip of geotextileFilter fabric that is installed to separate dissimilar soils and provide runoff filtration and contaminant removal benefits while maintaining a suitable rate of flow; may be used to prevent fine-textured soil from entering a coarse granular bed, or to prevent coarse granular from being compressed into underlying finer-textured soils. or membrane placed over the pipe to reduce the migration of finesSoil particles with a diameter less than 0.050 mm. from overlying media. Perforated pipes are a common component of underdrains, infiltration trenches and exfiltration trenches. Pipes should have been manufactured in conformity with the latest standards by the Canadian Standards Association (CSA) or ASTM International. Perforated pipes should be continuously perforated, smooth interior HDPE (or equivalent material). Wherever possible pipes should be ≥ 200 mm internal diameter to reduce clogging and to facilitate inspections and maintenance. Smooth interior facilitates inspection and maintenance activities; internal corrugations can cause cameras or hydrojetting apparatus to become snagged. A perforated pipe with many rectangular slots has better drainage characteristics than a pipe with similar open area provided by fewer circular holes . Non-perforated pipes should be used for conveyance to and away from the facility, including overflow. It is good practice to extend the non-perforated pipe approximately 300 mm within the reservoir or practice to reduce the chance of migration from native soils clogging the pipe at the interface. Perforated pipes awaiting installation, note the 30 degree connector used to facilitate maintenance. The site of the infiltration facility must remain outside the limit of disturbance and blocked from site traffic until construction of the facility begins, to prevent soil compaction by heavy equipment. This area must not be used as the site of sedimentSoil, sand and minerals washed from land into water, usually after rain. They pile up in reservoirs, rivers and harbors, destroying fish-nesting areas and holes of water animals and cloud the water so that needed sunlight might not reach aquatic plans. Careless farming, mining and building activities will expose sediment materials, allowing them to be washed off the land after rainfalls. basinsGround depression acting as a flow control and water treatment structure, that is normally dry. during construction, as the concentration of finesSoil particles with a diameter less than 0.050 mm. will reduce post-construction infiltrationThe slow movement of water into or through a soil or drainage system.Penetration of water through the ground surface.. This area must not be use as a staging area, for storing materials. To prevent sedimentSoil, sand and minerals washed from land into water, usually after rain. They pile up in reservoirs, rivers and harbors, destroying fish-nesting areas and holes of water animals and cloud the water so that needed sunlight might not reach aquatic plans. Careless farming, mining and building activities will expose sediment materials, allowing them to be washed off the land after rainfalls. from clogging the surface, stormwater must be diverted away from the facility until the drainage areaThe total surface area upstream of a point on a stream that drains toward that point. Not to be confused with watershed. The drainage area may include one or more watersheds. is fully stabilized. As many infiltration facilities are installed in the road right-of-way or tight urban spaces, considerations of traffic control and utility conflicts must be part of the plans and inspections. The area should be fully protected by siltSoil or media particles smaller than sand and larger than clay (3 to 60 m) fence or construction fencing to prevent compaction by construction traffic and equipment. Installation may only begin after entire contributing drainage areaThe total surface area upstream of a point on a stream that drains toward that point. Not to be confused with watershed. The drainage area may include one or more watersheds. has been either stabilized or flows have been safely routed around the area. The designer should check the boundaries of the contributing drainage areaThe total surface area upstream of a point on a stream that drains toward that point. Not to be confused with watershed. The drainage area may include one or more watersheds. to ensure it conforms to original design. The pretreatmentInitial capturing and removal of unwanted contaminants, such as debris, sediment, leaves and pollutants, from stormwater before reaching a best management practice; Examples include, settling forebays, vegetated filter strips and gravel diaphragms. part of the design should be excavated first and sealed until full construction is completed. Excavators or backhoes working adjacent to the proposed infiltration area should excavate to the appropriate design depth. The soil in the bottom of the excavation should be ripped to promote greater infiltrationThe slow movement of water into or through a soil or drainage system.Penetration of water through the ground surface..
Any accidental sedimentSoil, sand and minerals washed from land into water, usually after rain. They pile up in reservoirs, rivers and harbors, destroying fish-nesting areas and holes of water animals and cloud the water so that needed sunlight might not reach aquatic plans. Careless farming, mining and building activities will expose sediment materials, allowing them to be washed off the land after rainfalls. accumulation from construction should be removed at this time. Install erosion controlIncludes the protection of soil from dislocation by water, wind or other agents. to all inlets!! Inspect and remediate deficiencies after any significant rainfall within the next 3 months or remainder of the first growing season. BioretentionA shallow excavated surface depression containing prepared filter media, mulch, and planted with selected vegetation. Partial infiltrationThe slow movement of water into or through a soil or drainage system.Penetration of water through the ground surface. :Place design depth of 50 mm diameter clear stone for the infiltration volume on bed and then lay the perforated underdrainA perforated pipe used to assist the draining of soils. pipe over it. Pack more clear stone to 75 mm above the top of the underdrainA perforated pipe used to assist the draining of soils., top with 100 mm of choker layer. Media installed over the choker course in 0.3 m lifts until desired top elevation is achieved. Each lift must be thoroughly wetted and drained before adding the next. Wait three weeks to check for settling, and add additional media and regrade as needed. Prepare planting holes for any trees and shrubs, install vegetation, and water accordingly. Install any temporary irrigationHuman application of water to agricultural or recreational land for watering purposes. City of Toronto Wet Weather Flow Management November 2006 47. Plant landscaping materials as shown in the landscaping plan, and water them weekly in the first two months. Lay down surface cover in accordance with the design (mulcha top dressing over vegetation beds that provides suppresses weeds and helps retain soil moisture in bioretention cells, stormwater planters and dry swales., riverstone, or turf). Conduct final construction inspection, checking inlet, pretreatmentInitial capturing and removal of unwanted contaminants, such as debris, sediment, leaves and pollutants, from stormwater before reaching a best management practice; Examples include, settling forebays, vegetated filter strips and gravel diaphragms., bioretentionA shallow excavated surface depression containing prepared filter media, mulch, and planted with selected vegetation. cell and outlet elevations. Remove erosion and sedimentSoil, sand and minerals washed from land into water, usually after rain. They pile up in reservoirs, rivers and harbors, destroying fish-nesting areas and holes of water animals and cloud the water so that needed sunlight might not reach aquatic plans. Careless farming, mining and building activities will expose sediment materials, allowing them to be washed off the land after rainfalls. controls, only when the entire drainage areaThe total surface area upstream of a point on a stream that drains toward that point. Not to be confused with watershed. The drainage area may include one or more watersheds. is stabilized. Trench laid in advance of the surrounding catchmentThe land draining to a single reference point (usually a structural BMP); similar to a subwatershed, but on a smaller scale. being finished. This system would benefit from some geotextileFilter fabric that is installed to separate dissimilar soils and provide runoff filtration and contaminant removal benefits while maintaining a suitable rate of flow; may be used to prevent fine-textured soil from entering a coarse granular bed, or to prevent coarse granular from being compressed into underlying finer-textured soils. on the surface to prevent sedimentSoil, sand and minerals washed from land into water, usually after rain. They pile up in reservoirs, rivers and harbors, destroying fish-nesting areas and holes of water animals and cloud the water so that needed sunlight might not reach aquatic plans. Careless farming, mining and building activities will expose sediment materials, allowing them to be washed off the land after rainfalls. from accumulating before the asphaltA mixture of mineral aggregates bound with bituminous materials, used in the construction and maintenance of paved surfaces. is laid. 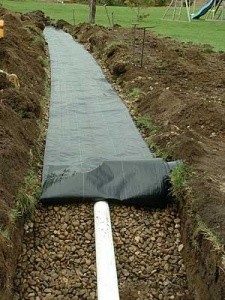 Good use of geotextileFilter fabric that is installed to separate dissimilar soils and provide runoff filtration and contaminant removal benefits while maintaining a suitable rate of flow; may be used to prevent fine-textured soil from entering a coarse granular bed, or to prevent coarse granular from being compressed into underlying finer-textured soils., being limited to preventing finesSoil particles with a diameter less than 0.050 mm. from entering the trench from above. ↑ Design criteria for Infiltration trench. (2016, September 21). Minnesota Stormwater Manual, . Retrieved 13:25, April 4, 2018 from https://stormwater.pca.state.mn.us/index.php?title=Design_criteria_for_Infiltration_trench&oldid=28702. ↑ Hazenberg, G., and U. S. Panu (1991), Theoretical analysis of flow rate into perforated drain tubes, Water Resour. Res., 27(7), 1411–1418, doi:10.1029/91WR00779. This page was last edited on 7 January 2019, at 02:18.